JCB Precision Tool and Mold Inc.
Cumberland mdl. 585GRAN 3kN 20” Plastics Granulator s/n 35910-709. Nelmore mdl. RG810M 10” Plastics Granulator s/n 8111117384. Glouchester mdl. 6-8 BP-5 6” Plastics Granulator s/n 23810-01. Conair mdl. 181-045 Cartridge Dryer w/ Hopper and Loader. Conair mdl. D100H511 Dehumidifying Dryer. Conair mdl. 18000308S Dehumidifying Dryer s/n 0-0196 w/ 250 Lb Hopper. AEC Whitlock Dehumidifying Dryer w/ Conair 200 Lb Hopper and Stand. Whitlock mdl. DH-200FI 200 Lb Drying Hopper s/n 90B240. Dri-Air mdl. ARID-X75D Plastics Dryer s/n D8024 w/ Hopper. Una-Dyn 600 Lb Hopper w/ Vacuum Loader. ARI mdl. TSA240S4DN1G High Output Chiller s/n 5609J05212. AEC mdl. DSA-3-CH Large Capacity Process Chiller s/n 83F197. Thermal Care “Vac-Therm” Vacuum Process Chiller s/n 61938-04-07. AEC mdl. TDWG/M09S6 Process Chiller s/n 95F5699. Advantage mdl. TS-925-42D1X Process Chiller s/n 8928. Advantage mdl. TS-925 Process Chiller s/n 6720. 36” x 72” x 65” Water Recovery Tank w/ Pumps. Erico 6-Zone Heater Controller.Plastic Process Barrel Shaker/Mixer. 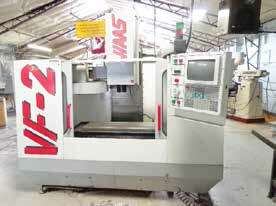 1996 Haas VF-2 CNC Vertical Machining Center s/n 6742 w/ Haas Controls, 20-Station ATC, BT-40 Taper Spindle, 7500 RPM. 1999 Mitsubishi M-V5C CNC Vertical Machining Center s/n V53270 w/ Mitsubishi Controls, 18-Station ATC, CAT-40 Taper Spindle, Chip Auger. Supermax MAX-1 Rebel CNC Vertical Machining Center s/n 805892 w/ Fanuc Series 0-M Controls, 20-Station ATC, CAT-40 Taper Spindle, Hand Wheel. Van Dorn mdl. 450-RS-60F 450-Ton Plastic Injection Molding Machine s/n 450-RS-60F-647 w/ Van Dorn Controls, 30” x 30” Between Posts. Reed mdl. 400TG 400-Ton Plastic Injection Molding Machine s/n G500701 w/ GE PM2000 Controls, 28” x 28” Between Posts, Conair Color Blender and Loader. Engel mdl. ES 750 250 250-Ton Plastic Injection Molding Machine s/n 7747 w/ Engel Controls, 20” x 20” Between Posts. 1992 Nissei P mdl. FS210S50ASE 210-Ton Plastic Injection Molding Machine s/n S21M002 w/ NC-8000F Controls, 22 ½” x 22 ½” Between Posts. Cincinnati Milacron mdl. 150-8 150-Ton Plastic Injection Molding Machine s/n 4001-A41/84-2 w/ Cincinnati Controls, 16” x 16” between Posts. Cincinnati Milacron mdl. 150-8 150-Ton Plastic Injection Molding Machine s/n 4001- A41/84-3 w/ Cincinnati Controls, 16” x 16” Between Posts. Reed 100-Ton Plastic Injection Molding Machine s/n G500547 w/ GE PM2000 Controls 14” x 14” Between Posts. 1998 Boy mdl. 80M 80-Ton Plastic Injection Molding Machine s/n 87942 w/ Boy Digital Controller. JSW mdl. N70B II 70-Ton Plastic Injection Molding Machine s/n 5-283-663 w/ JSW Controls, 13” x 11 3/8” Between Posts. Auto-Jectors mdl. HR30-S 30-Ton 4-Station Rotary Vertical Plastic Injection Molding Machine s/n HR3D-40-1289 w/ Auto-Jectors Controls, 36” Rotary Table. Engel mdl. ES30 30-Ton Plastic Injection Molding Machine s/n 28-1479 w/ Engel Controls, 8 5/8” x 8 5/8” Between Posts. Victor mdl 1640 16” x 40” Geared Head Gap Bed Lathe s/n 564501 w/ 65-1800 RPM, Inch/mm Threading, Tailstock, Trava-Dial, Tool Post, 12” 4-Jaw Chuck. 1994 Falcon Chevalier ED-203 Die-Sinker EDM Machine s/n 0001139 w/ Sony DRO, ED-Bipulse Power Source, 5” x 10” Electromagnetic Chuck. 1989 Falcon Chevalier ED-252 Die-Sinker EDM Machine s/n 0002234 w/ Anilam 3-Axis DRO, EDBipulse Power Source, System 3R Tooling Head, 6” x 12” Magnetic Chuck. Taper Tooling, Vises, Collets, Precision Grinding Fixtures. Tool Boxes and Perishable Tooling. Kodak mdl. 30 30” Floor Model Optical Comparator w/Rutland DRO. Surface Plates and Height Gage. Toyota 7FBCU45-BCS 8850 Lb Cap LPG Forklift s/n 63035 w/ 3-Stage Mast @ 199” Lift Height, Side Shift. Crown mdl. 35RGT 3500 Lb Cap Electric Single ReachPallet Mover s/n W87172 w/ 198” Lift Height, Charger. Presto mdl. M366 1000 Lb Cap Hydraulic Die Lift Cart. Die Racks and Pallet Racking. Falcon Chevalier FSG-618M 6” x 18” Surface Grinder s/nA382B042 w/ Sony DRO. Kent RGS-250 8” x 20” Surface Grinder s/n 841006-1 w/Wheel Dresser, Magnetic Chuck. DoAll D618-7 6” x 18” Automatic Surface Grinder s/n219-71650. Covel 6” x 18” Automatic Surface Grinder. Deckel mdl. SO Tool and Cutter Grinder s/n 81/20836 w/Collets, Cabinet Base. CutterMaster FCG-30 Tool and Cutter Grinder w/ 5C Air Fixture. Fosdick 12” Column x 30” Radial Arm Drill s/n 12090 w/37-1406 RPM, Power Feeds, Power Column, Tooling Riser Block. Thermo Dynamics “Pak Master 75 XL Plus” Plasma Cutting System s/n 01684467. Dytron Corp “Microtron” Micro Welder. Lapper mdl. PW-10 Ultrasonic Plastics Welder s/n WCH2K- 41665. Econoline Dry Blast Cabinet w/ Dust Collector. Continental BS100M 10” Horizontal Band Saw s/n 11190. DME Ultraform mdl. UF-2100 Die Polisher. Curtis CV969A 5Hp Horizontal Air Compressor. Quincy mdl. QT-5 5Hp Horizontal Air Compressor. Bel-Air mdl. AFD20-1 Refrigerated Air Dryer. Electrolux 200 Deg C Drying Oven. (2)Torit mdl. 64 Dust Collectors. Sterlco mdl. 990 Die Scale Cleaning System.